Neither of these games need a real introduction, since they were included in the Unique Games series (in parts 5 and 10), I will skip the "Description & Review" segment for once. However, we do still need to see, what sort of a status the two games have on our favourite websites. 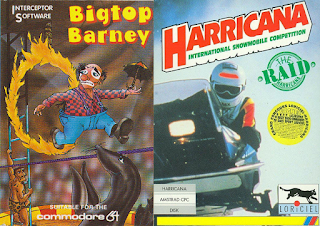 Bigtop Barney's C64 original has a score of 6.9 from 15 votes at Lemon64, while its Amstrad contestant has no reviews or scores to be found at all, which probably says a lot. 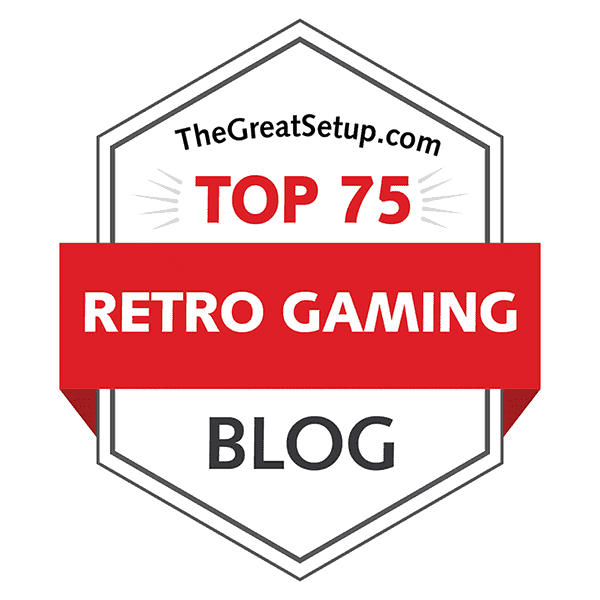 As for Harricana, the score at CPC-Power is 10.67/20.00, and the CPC Game Reviews review has a 7 out of 10, while the ST version has a 5.0 rating at AtariMania from 2 votes, and the LemonAmiga score is a hilariously low 1.7 from 10 votes, making it the worst version of any game featured on the blog so far. Let's get on with it. Interceptor has never had a reputation of publishing games that are easy to play. With Bigtop Barney, they took a break from their norms. I'm not really calling the game easy as such, but it's definitely easier than most Interceptor's games. It does come with a price, though: there are four different kinds of events, or acts, that you need to learn to play, each requiring different sorts of strategies. Act 1 is a semi-traditional tightrope event, in which you need to avoid getting hit by monkeys and fiery rings, while collecting money bags and points by jumping through the most difficult rings, preferably over the monkeys simultaneously. Act 2 is an odd platformer, in which you need to collect all the balloons from the screen within the given time/energy. The trick is, if you jump from platform straight up onto the platform above, some of your energy/time is drained more quickly than when you're merely walking, so you need to focus on using as little of energy as possible and plan your balloon-collecting route accordingly. Act 3 is almost the same as act 1, but this time, you're riding a unicycle to the opposite direction while jumping off trampolines of different height and width, and some of them even move back and forth vertically to make your life more miserable. Landing back on your unicycle after not bouncing off from any trampoline will result in a fault, and hitting a trampoline from a bad angle will also fail your attempt. Act 4 is the most difficult one, mostly because it features an element of luck. You jump around on cushion-like trampolines, swing on ropes, use escalator-like things to lift yourself to platforms and walk around with no real method of stopping yourself, which is annoying. Your mission is to compile a key from a number of key parts that appear one after the other all around the screen, and once the key is finished, use it to open a cage and free your monkey friend. The element of luck comes in the form of fire-breathers, who do their thing on a whim, but at least they do it together and rather slowly. Benham's original C64 code contains such delicate things as curved jumping velocities and proper collision detection, which either escaped the notice from the AMSTRAD conversion coder, or perhaps it was too difficult to achieve within the time given for making the conversion. Or perhaps the party responsible for getting the game onto the CPC in the first place wasn't too interested in getting it right, just making a quick buck. The collision detection problem in particular is what really makes the AMSTRAD version such a pain in the sitting muscles. Jumping through the fire hoops in act 1 is ridiculously difficult, because you have to perform pixel-perfect jumps while taking into consideration, that the Barney sprite extends a pixel or two beyond the visible area. In act 2, the collision detection bug actually sometimes helps from getting hit by the beach balls, but it also makes you sometimes walk through the balloons without collecting them. Acts 3 and 4 suffer mostly from the oddly floaty jump mechanics. The original version isn't without its fair share of difficulties, either: instead of a clear numeric time/energy indicator, you are given a depleting meter, which doesn't always seem to hit the bonus time range when you complete an act. Also, in act 4, the fire-breathers can start two fires back-to-back, which I've seen never happen in the AMSTRAD version - this can easily result in failures due to jumping too long in place and hitting the ceiling, or even worse, the time running out. I have also noticed, that it is a bit more difficult to grab onto the swinging ropes on the C64 than it is in the AMSTRAD version. However, the other three events are much more comfortable to play in the original version. Both versions feature an options menu, in which you can adjust the number of lives to start with, the starting difficulty level and the scores for when you will be awarded extra lives. In the original C64 version, you can access this menu by pressing F3 in the title screen, but the AMSTRAD version always features this screen when you start the game. The options menu screen also features the level selection menu as a small icon at the bottom, instead of a large selection arena, as it appears on the C64. Once you have chosen your options and started the game, though, you cannot change them, which makes it a bit odd to include them onto the same screen as the level selection screen, since you will be seeing them all during the entire course of your game. What has always struck me as odd about old circus-themed games, is that the areas usually very much limited by the boundaries of a circus tent are not altogether quite as limited in games. A good example of this is Konami's Circus Charlie, where most of the events take place within a sports arena sized area. Bigtop Barney exhibits this same odd style of unlimited areas in the two scrolling acts, but at least the two other acts are restricted to single screens. Then again, I can't imagine the balloon-collecting act happening in a real circus, at least inside the bigtop. Anyway, let's get on with it. Loaders and title screens, Commodore 64 on the left, Amstrad CPC on the right. Only the C64 original features a proper Interceptor loading screen, with a scrolling text at the bottom, a loading time indicator and a pixelated version of the cover art. The AMSTRAD loader uses a default Players loading screen, which was only used for Amstrad games which didn't have any other kind of a loading screen for one reason or another. It's not a bad looking screen, it's just nothing special. In case anyone was worried, the loading screens still have no impact on the overall graphics scores. The title screen shows a properly visible title logo at the top third of the screen, with Barney's face either in the middle of the screen (C64) or between the two words (CPC). The obvious credits and copyrights are shown at the left, right and bottom middle areas of the screen. Seeing as Barney's face inhabits the middle of the C64 title screen, the AMSTRAD screen looks oddly empty at the center, and there's also a display of alternating colours in the bottom text display, which the CPC version is left without. One particularly odd detail about the AMSTRAD title screen is the blue horizontal line crossing the screen just above the left and right text areas, which is only shown during the title theme tune. Barney's options and act selections. Left and middle: Commodore 64; Right: Amstrad CPC. As you start the game, you are taken to either a level selection screen on the C64, or an options screen featuring the level selection on the CPC. In terms of both logic and graphics, the original beats the conversion - after all, why show the full options after the game has started when you can't adjust them; and it's just much nicer to see small depictions of all the events in one circus-coloured grid, rather than just a small icon at the bottom of the screen with no embellishments. Screenshots from Act 1. Top row: Commodore 64. Bottom row: Amstrad CPC. Act 1 sets a rather clear tone for the rest of the graphical comparison. The most eye-catching thing about the level is the audience area. In the C64, the audience graphics are neatly layered from quite a few monochrome characters, most of which scroll at their own separate speed. You can't see the ground area moving at all in the AMSTRAD version, because the ground layer has no features that would be visible in scrolling - they're just straight lines. What the AMSTRAD version wins in colour, it loses in parallax scrolling and the swiftness of animation when you are applauded. 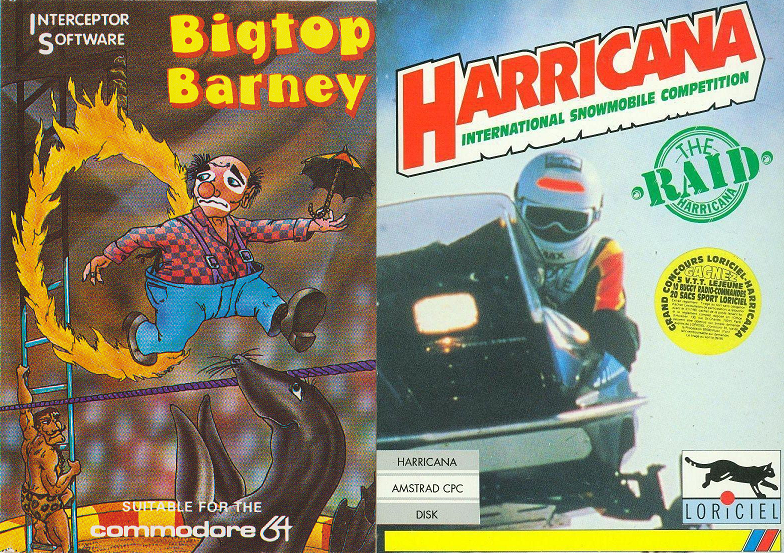 The top half of the screen tells a similar story: Barney's and the monkey's sprites are multi-coloured in both cases, but the C64 version has more distinguishing features. The fire hoops are the only things that have a rather underdeveloped look about them in both versions, but still, on the C64 they look fuller and the fire is actually animated. It probably doesn't need pointing out, but even the text bits above the action area of the screen are more pleasantly circus-like to look at on the C64 with all those colours going on. All the text in the AMSTRAD version is just boringly white. Screenshots from the first three stages of Act 2. Top row: Commodore 64. Bottom row: Amstrad CPC. The differences and the status of each version gets even more obvious in act 2. Not instantly, though: the general graphical qualities have been determined in act 1, but you need to perform a jump from a platform to the one directly above you to see that there is no specific animation made for such an action in the AMSTRAD version, while on the C64, Barney turns to the camera, visibly pushes down to perform the jump, and even flaps his hands during the jump. After you have managed to finish the first stage in act 2, the second stage reveals a complete lack of progress in the level graphics in the AMSTRAD version, whereas on the C64, you are at least provided with a change of colours for all platforms, and even the strength meter. One really curious detail about the AMSTRAD version is, that the scores displayed for when you pick up a balloon are always viewed on the same spot, which is on the left side of the screen, just below the topmost platform - the C64 version shows the gained scores where the balloons used to be. Screenshots from Act 3. Top row: Commodore 64. Bottom row: Amstrad CPC. Act 3 continues with the same basic graphic motif used in act 1, but now the ground level is blue, and the gained scores are displayed below your unicycle. The most interesting difference in detail comes when you get to the finish, or "HOME" as it's called in the game - the platform you need to jump on looks somewhat like an olympic fire cauldron on top of an odd-looking towering structure, and there's a huge "HOME" sign next to it, while in the AMSTRAD version, the platform itself features the word "HOME", the said platform is lower than the C64 one, and there is no sign next to it. There are no other particularly interesting differences here. Screenshots from the first three stages of Act 4. Top row: Commodore 64. Bottom row: Amstrad CPC. Get Ready, Time Bonus and Game Over screens. Left: Commodore 64. Right: Amstrad CPC. After your final utterance of "Drat! ", the game will be over. Nothing too new about the lack of graphics in either version, but in the usual manner, the C64 version uses some colour in its text, while the AMSTRAD goes with plain white. Also, the time bonus screen uses a yellow/purple colouring on the C64, as opposed to the white and inverted white text on the AMSTRAD. The big thing is the Get Ready screen, which in the AMSTRAD version is just a basic Get Ready screen, and the C64 version offers you a brief description of what to do in the act, as well as a view of the bigtop and a couple of other circus-y things from afar. That definitely counts as more graphics, even though it's not particularly pretty. Fits the rest of the game well enough, though. The final nail in the AMSTRAD version's coffin in terms of graphics is the missing curtain effect for when you start the game or lose a life. So, we're once again on clear footing here. I remember having had some trouble finding the tunes in Circus Charlie, and I did get some help from an anonymous commenter for finding two of the tunes in the original game. I'm having similar trouble again with some of the tunes in the C64 version of Bigtop Barney, as well as the Game Over tune in the AMSTRAD version, so if any of you have any idea, what are the originals, please do throw a comment. The C64 version starts off with a nice three-voice (bass and two main melody lines) rendition of Scott Joplin's "Peacherine Rag", which is also used for act 4. John Philip Sousa's marches are the most commonly used circus tunes in games, and so Bigtop Barney also uses two of his tunes: the "Liberty Bell March" (also known from Monty Python's Flying Circus) in act 1, and the "Washington Post March" in act 3. The tune for act 2 sounds kind of ragtime-y, but I haven't managed to track it down as anything specific - could well be an original composition from Robert Westgate. Also, the act selection screen sounds infuriatingly familiar, and could also be one of Sousa's marches or any other fairground/circus tune, or even a children's song considering its simplistic melody and chord progression, but I just haven't managed to track it down either. The remaining tunes are small ditties for losing a life and the Game Over screen (only when you get the high score), both of which sound like they could well be excerpts from any circus tune, but also could well be Westgate's original tunes. Any information on this would be well appreciated. Anyhow, that's 7 different tunes, which is a huge amount for a game of this age and genre. Unfortunately, there are not nearly as many sound effects to accompany the music, which is perhaps just as well - you just get crowd cheering when the act is completed, a smash noise for when you fail (Drat! ), a falling whistle noise when you fall down from the tightrope, and an oddly spacey bonus score indicator noise. A big part of why not finding the act selection music was so infuriating for me is, because it's the only tune from the C64 version also included in the AMSTRAD version. This time, it's not used for the same purpose, though: you hear it as the main title tune instead, and it's notably faster than the C64 version, giving it much more of a frantic circus-actiony feel, instead of a fairground ditty. Of course, being a cheap conversion that the Amstrad version of Barney is, you won't expect there to be any particularly sophisticated sound tricks, such as attack, decay, or even dynamics. Nor are there different sound types to be heard in the few tunes in the Amstrad version - it's just all basic bleepity-bloopy AY-chip stuff. The aforementioned other tunes are the usual brief excerpt from the Funeral March when you lose a life, and then there's a different High Score/Game Over tune, which I can't recognize - might be an original. As for the sound effects, I could count three of them for the CPC: the all-too often heard crowd cheering effect (you can even hear it when landing a jump on the tightrope with no particular trick done), a bulky boing-boing sound for completing an act, and an ascending single-tone non-arpeggio for receiving time bonus. On paper, it doesn't look too bad, but because none of the acts have music included, the overall feel of Bigtop Barney's Amstrad version is a bit unfinished. While Harricana was also briefly reviewed for the Unique Games series (#10), I only touched briefly upon the Amstrad version, since at the time, I wasn't aware of the Amiga and Atari ST versions. As was established already in the said article, it's not a particularly good game, even though some aspects of riding a snowmobile felt all too familiar. Perhaps now with three versions under inspection, perhaps we can find a good idea of what the game was supposed to be like. The thing I am personally most interested about here, is: what is it, exactly, that makes any game deserve a rating less than 2.0 out of a maximum 10 on the Amiga? As a quick recap for those of you who don't want to browse through the aforementioned Unique Games #10 entry, the basic gameplay goes like this: you ride your snowmobile from a behind-view perspective, and you can only turn the vehicle in 45-degree angles, but only to your left or right extremes. You can also reverse the snowmobile at a slow speed, if you get stuck, but in most cases of getting stuck, you can just try to pry yourself ahead by re-accelerating each time you hit the obstacle. The idea is to follow a series of small flags until you reach the end of the course, as fast as you possibly can, against a number of other snowmobile racers. You can only play Harricana in single-player mode, and there are no gameplay options to adjust. As soon as you have pressed the fire button in the title screen, the game starts. Believe it or not, the AMSTRAD version is the most playable one of the lot, and I don't even need to elaborate on this with too many words. Both the ATARI ST and AMIGA versions are, in fact, equally horrible to play, which makes me wonder if anyone ever actually bothered to play either of them long enough to notice. See, there are four main points compared to the AMSTRAD original, that make the 16-bit versions clearly inferior: 1) with the naturally slower speed, it's easier to play on the long run (even though the snowmobile controls with more lag than on the 16-bits); 2) there is a string of paired gates you must follow in the AMSTRAD version, while on the 16-bits, you need to keep track of a single string of flags; 3) all the objects in the snow make you bump or crash into them on the 16-bits, while in the AMSTRAD version, some of the smaller obstacles can make you jump; and 4) the collision detection is way off on the 16-bits, which is infernally annoying because the pseudo-3D scrolling engine doesn't really work as smoothly as it's supposed to. That's actually enough reasons for me to get to the scores already. There are certain pros and cons in both 8-bit and 16-bit versions, at least when it comes to Harricana's graphics. Naturally, the AMSTRAD version has to struggle with worse framerate and a lack of colours to utilise for each section, but this being a game about a winter motorsport, you really don't have that much of choices for colours on the 16-bit machines, either. Screenshots of Harricana's title sequences. Leftmost and middle left: Amstrad CPC. Middle right: Atari ST. Rightmost: Commodore Amiga. The game starts with a title sequence, which is nice enough for both 8- and 16-bit versions, although naturally, the 16-bit version is more sophisticated. The original AMSTRAD intro is just four solid slides of pictures, two of which are the game's credits made in two wintery fonts (white and blue), and two of which are the "Loriciel presente" and the game logo pictures as you see them above. The 16-bit versions add a good deal of animation, as already the Loriciel picture gets built onto the screen by the cat running from the left to the center and a red ball bouncing from the right to the spot where the first 'i' in Loriciel settles at. In the 16-bit versions, only the word "presente" uses the same font as the Amstrad version's credits, and it's the last item to get drawn onto this screen before the picture changes. The change happens by the red ball opening up and turning into the round stopwatch-like frame in the game logo picture, then the other items appearing one by one - the wolf, the snowmobile and the logo itself - and finally, the credits start scrolling under the logo while the Loriciel cat keeps running over the credits in a loop. And then you're thrown into the game without a chance to evaluate your choices, since there aren't any. The good thing about it is, we don't need to dwell on the game any more than absolutely necessary. So, level 1 takes us to Lake Edward in Quebec, and as it so often happens, the lake is inundated with flags, fallen logs, small trees and tree stumps. But then, as you will see from further screenshots below, so is the case in all the other etapes as well. ...the more natural look of the 16-bits becomes a bit irritating, since it doesn't offer enough of variation - with snow, everything tends to look the same. If you care to look closer, you will see some differences in the background mountains and forests to the previous section. It's also obvious that this section looks a bit darker than the previous, but with looming darkness, you would expect the snowmobiles to have lights turned on at this point, but no. The AMSTRAD version goes for a drastically different colour scheme, which sets a completely different mood to each new level, which can be a good thing, even if it can be a bit of a shock to anyone not used to a general lack of colours. Standings, left to right: Amstrad CPC tape version, Amstrad CPC disk version, Atari ST/Amiga. Between each level, you will be shown the current standings on a board of sorts. The AMSTRAD tape version only has a very basic sort of a board, while the disk version includes a nice blue picture in the background, featuring a thematically fitting ice-fisher. In addition to plenty of colour, the 16-bit versions add a very French-looking character sliding onto the screen for no reason at all, other than winking at you and getting into the way of showing the much more thematically fitting ice-fisher. Screenshots from further Etapes, in the usual order. Further sections only make the differences between the two graphic styles. Sure, the 16-bits feature more graphics, the majority of which is much nicer to look at than the less colourful and contentful AMSTRAD graphics, and due to the better machine architectures on both ST and AMIGA, the pseudo-3D scrolling is vastly improved. Too bad the actual 3D effect is spoiled by awkward controllability and bad collision detection. But that's not strictly a graphical problem, is it? To my knowledge, Harricana only features one tune, which is the theme tune played in the title sequence. Since I have no intention of ever completing Harricana, a quick YouTube check shows that the AMSTRAD version features no additional music or anything else in the ending screen, and that people aren't interested enough in the 16-bit versions to actually make a longplay of either of them. Understandable. Anyway, the theme tune is a sporty rocking tune, which sounds naturally better on the 16-bits, but more interestingly, both 16-bit versions sound pretty much the same. Actually, the 16-bit title sequence starts with a bit of wind blowing noise and three orchestral hit chords as the Loriciel logo is built, before a sample of a wolf howl is played as the wolf head comes onto the screen and a cheaply rendered snowmobile/chainsaw noise plays when the snowmobile enters the screen. After a bit more wind blowing noise, the title music kicks in as the credits start rolling under the logo. The 16-bit version of the title tune features samples of a kick drum and a very reverberated snare drum, a staccato synth bass, some jangling piano and a sampled trumpet melody, which back then must have been state-of-the-art, but now is worth a couple of facepalms at least. When you slap on the space bar to begin the game, a short coda is played for the theme tune without any musical interlude leading to it. The only way the AMIGA version differs from the ST version is a higher samplerate and an odd way to use the stereo channels. To be honest, I actually prefer the original AMSTRAD rendition of the tune exactly because it doesn't feature any sampled instruments. Even the drum track sounds more fitting because it's not sampled, and you also get a 16th note hi-hat thing going on with the other drums. I guess it's an acquired taste, but I still have to admit the 16-bit rendition is the more technically impressive one, and they do feature those wind and wolf samples, which are nice. There aren't too many sound effects in Harricana. The only sounds I remember having ever heard in the game are your snowmobile's engine droning, which is irritating at best (although I have to admit, it's not exactly a joy to listen to in real life either), and two different clunks for hitting a natural obstacle or a fellow racer. But as unimpressive as that sounds, all that's for the 16-bits - the AMSTRAD version only features different kinds of low beeping, as if you were playing the game on an old IBM-PC instead. Once again, things are pretty clear here. Two very different games from very different circumstances, with only two things to connect them into this two-for-one comparison entry: both games were mistakenly used in my Unique Games series, and both games were made for the Amstrad CPC and then some other machine(s), but in both cases, the said other machines were very different. That's it for now - another entry down. It's time for me to start preparing for next month's Halloween-themed special, which will be another big one, but until then, I've got another quick one coming for you at the end of this month. Thanks for reading again, hope it was worth the bother.